Welcome to Just A Blog Hop! If you came here from Denise Marzec’s blog then you’re on the right track. If not, then you’ll want to head over to Jami Sibley’s blog to start the hop from the beginning. Next stop on the hop is Deborah Robb! We were invited to put aside all of our stamping oriented obligations and deadlines and create something just for fun. The hop guidelines were simple: choose a challenge to play and choose either a new uninked stamp or an old favorite. Create a card and mail it to someone. What could be better to celebrate World Card making day? I decided to play one of the Splitcoststampers Sketch Challenges from the past few weeks: Sketch Challenge 298! I love to do sketch challenges because it helps take a big load off when you just want to enjoy using some new (or old!) stamps! A lot of times the sketches help me decide which stamps to use for a project. 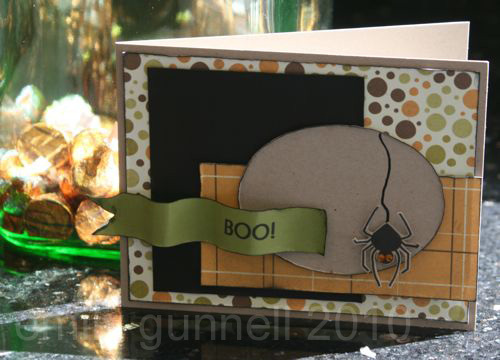 I knew I wanted to do a Halloween card and loved the fun and simple layering to this layout. I used one of my PaperTrey Ink stamp sets, I just love the charming simplicity of the lines in their images! This spider was yet to be inked, so he was perfect for today! I do hope you forgive me for the poorly cut out spider! I had high hopes to have my craft room put together so that I could stamp in an organized room, but as it happened I got sick this week and spent some time napping instead of organizing (it was kinda nice to have a good reason for a nap. LOL!). I also have yet to find my box of SU! ink pads, scissors, stamp cleaner, and sewing machine foot peddle, among other lost treasures that I am desperately hoping are in my garage! However, if you saw the scissors I used to cut out those little legs you’d believe in Santa Claus. 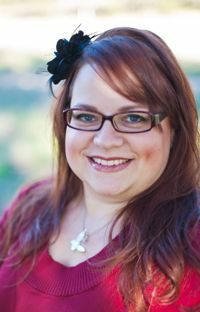 As a special treat for Just A Blog Hop, I’m offering a “Treats Only” give away! Just leave a comment and on Monday I’ll announce the winner! You’ll receive this card along with a box of stamping goodies, including at least one stamp set! This is coming from my stash that I just don’t use and it’s making me sad to see it neglected. I hope you enjoy Just A Blog Hop and find some inspiration to celebrate World Card Making Day! Super cute, Emily! Love the beautiful fall colors in that patterned paper! I love the sweet simplicity of your card, and I think you did an awesome job cutting out that spider! Well done! That spider is so cute! Great card! That is so cute! I love how you curved the “ribbon” tag! Very cool. And thanks for the chance to win something! Hurray! 😀 Happy WCMD to you! What spooky fun!! Love your little boo flag with that spider!! So good to see you stamping, Emily! I would have never attempted cutting out that spider. You ROCKED him! Loved catching up a little in your life. Congrats on the new house, and I adore your crocheted hats! Super sweet! Happy WCMD! You KNOW I love it when you stamp girl! So cute! And the scissors thing cracked me up! I can just picture you using a huge pair of shears or maybe a dull pair of kid scissors! That card is too cute and the spider was cut better than I could ever! Oh I love how you did the curvy tag! Fun! Cute Halloween card! I always check out your blog, thanks for sharing your talents! Great card, Emily. I don’t usually do Halloween Cards, but yours sure is inpiration to start! You are a saint to cut all those legs – please show us the scissors you used?!?!?! Wow! I wish I had your patience! Cutting that spider out sure makes this card POP! Love that you took the time to do that! Awesome! You always amaze me how you can see potential in some pieces of paper from your paper scraps (I would have gone with the oblivious piece of Halloween paper that had little ghost or witches or skeletons, but used a poked-dotted and plaid scraps with fall colors) and the colors combination (Again, I would have stayed in the oranges and blacks, but combined to me what is an ugly stone-like color to pop the spider) you use with a simple spider (cute spider with glowing eyes) and halloween word “boo” to make a clearly understood darling Halloween card. You can give the prizes to someone else, just send me the card!! What a fun card! I think your cutting out of the spider rocks… if I had attempted those little legs my spider would be an amputee (probably multiple limbs at that). 🙂 Hope you find your missing stamping goodies soon! Cute card! I can’t believe you cut out that spider with such precision… wow! I also like the 3D paper ribbon/banner… at least that’s what I think it is… please correct me if I’m wrong. I would love to win your card!!! WOW! Fabulous card! Love, love, love the BOO ribbon tag! Outstanding job on the sketch! Your card is super cute! Hope you find your missing items! Yikes, they are kind of important! btw, I think your spider looks perfect!! I just came across your blog and am now following you. Love this cute spider card and am looking forward to seeing other things you do. Have a blessed day.